The well-wooded island of Samos - Σάμος (Sisam in Turkish) is famous for its excellent wines, illustrated by the many vineyards that thrive on the fertile hills among lush vegetation. Three mountain ranges dominate the western half of the island, with Mount Kertetevs (1437 metres) and Ampelos (1137 metres) towering over Ilias (748 metres). It is geographically separated from Asia Minor by the Samos Strait which is just over one nautical mile wide. Samos belongs to the Eastern Sporades (sometimes referred to as the Southern Sporades) together with the equally beautiful islands of Chios, Lesbos, Ikaria and Limnos. The charter base of Pythagorion - near the airport - on the southeast coast of Samos is the best starting point to explore the other Sporades as well as nearby Patmos, Kos, Nisyros, Leros, Kalymnos and Pserimos. Pythagorion occupies the the site of the ancient Samos port, evidence of which can be found in for instance the town walls dated 4th century BCE. Further highlights are the underground Aquaduct constructed by Eupalinos in the 6th century BCE; the Temple of Hera and the Altar of Rhoikos. The Pithagorion marina lies further east. There can be violent gusts near the south - leeward - coast. In the Samos Strait expect currents of 1-3 knots setting towards the east-south-east. 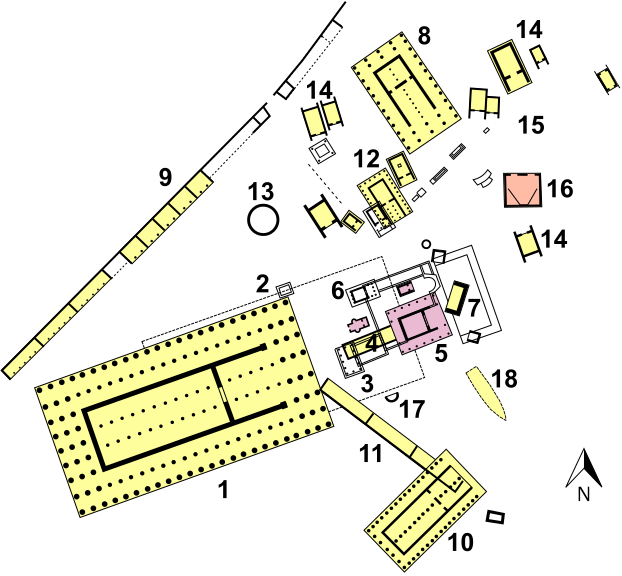 The Carians were probably the first to settle on Samos, followed at an early stage by the Ionians who used the island as a base for the conquest and colonization of the nearby coast of Asia Minor. In the second half of the 6th century BCE, under the tyrant ruler Polykrates, the island grew rich and powerful. Like other tyrants of that era, Polykrates erected magnificent buildings and fostered the arts. Although allied with Persia, he was executed by the Satrap Oroites about 522 BCE and succeeded by his brother Syloson. The island took part in the Ionian Rebellion, achieved independence and became a privileged member of the first Attic maritime league. 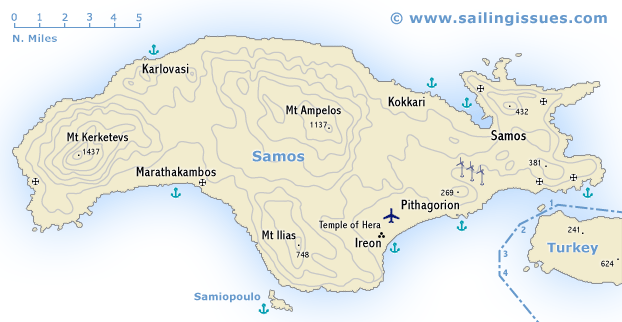 After a rising in 440 BCE Samos was conquered by Perikles, and until the end of the Peloponnesian War became a base for the Athenian fleet. Thereafter it was alternately under Spartan, Athenian and Persian influence. In subsequent centuries the island was held by Byzantines, Arabs (from the year 824 AD), Venetians and Genoese. The Turks depopulated and ruined the island at the end of the 15th century AD, which lead to a Turkish rule from 1509 till 1562. During the War of Greek Independence in 1821, the islanders held out against the Turks. And again in 1912 with help of the Italian forces.